I look for any excuse to bake. I'll sign up for any bake sale or office party potluck if it means I can bake something. I often use my Small Group and Book Club as unsuspecting guinea pigs for my new recipes. For instance, my Book Club was the taste testers for these brown butter chocolate chunk cookies. I knew they were a hit when i walked in with 18 cookies and left with none. There were only 6 of us. We each had 3 cookies. Yes, they were that good! I couldn't wait to share the recipe on the blog. Brown butter is a beautiful thing! It's just melted butter that has slightly....well....browned, which creates this amazingly rich flavor. The butter no longer tastes like butter. It takes on a nutty, toffee-like flavor that perfectly compliments...well...everything. Brown butter can be used in place of normal butter in lots of different recipes. For these cookies, I mixed in the liquefied butter just like I would a stick of softened butter. My only tip is to wait until it cools just a bit. You don't want to mix the eggs into hot butter. Once the eggs vanilla, flour, and other dry ingredients are mixed in, it's just like your average cookie dough. 95% of the time I would use chocolate chips in my cookies. 5% of the time I don't have chocolate chips on hand. But it reminds me how great chocolate chunks are in cookies! There are small pieces that just mix right into the dough and the larger pieces that create melted pockets of chocolate all through the cookie. There are two tips I have learned over the years to make excellent chocolate chip (or chocolate chunk) cookies. The first is to freeze the balls of dough before baking. To accomplish this, I scoop out my dough on to a small baking sheet and then pop it in the freezer for 10-15 minutes. Once they are frozen, I move them to a bigger sheet and give them a bit more space. Then pop them in the oven. The second tip is to sprinkle the unbaked cookie dough balls with flakey sea salt. Seriously, if there is one thing you take away from this post its this! 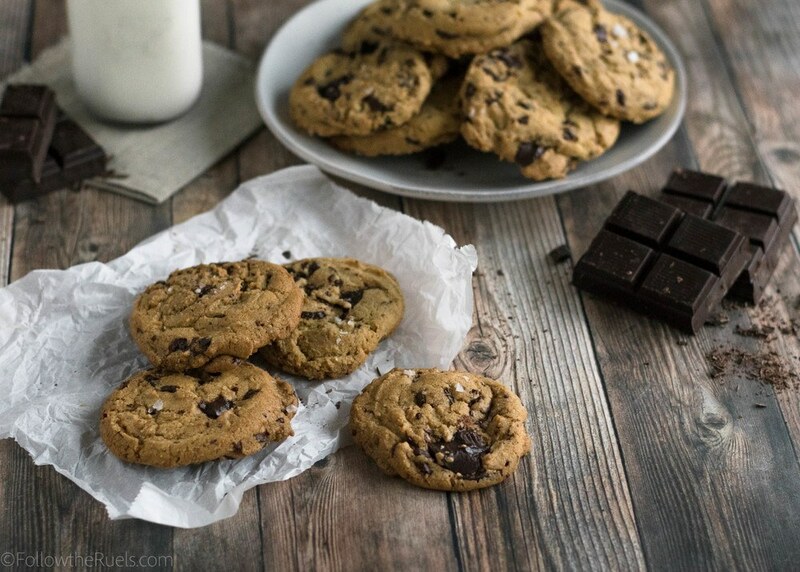 Sea salt and any chocolate chip cookie takes it to the next level. Out of the oven they look fairly unassuming, like ordinary CCCs. But these brown butter chocolate chunk cookies are not ordinary. They are extraordinary! Rhe best part is, people won't really know why they are different, but they will definitely taste the difference. The brown butter clearly sets these cookies apart, adding a subtle nutty flavor. Then the large chunks melted chocolate lightly dusted with sea salt just push these cookies over the edge. Promise me, just make them, give them to your friends, and then sit back and bask in the glory that will inevitably be rained down upon you. In a sauce pan over medium/medium-low heat, add the butter and melt. Allow to lightly simmer while continually swirling or stirring the butter around the pan so it doesn't burn. Once it comes to a warm chestnut brown color (about 5 to 7 minutes), take off the heat and let cool to room temperature. While the butter cools, whisk together the flour, baking soda, baking powder, and salt then set aside. In another large bowl, add the sugars and the butter. Mix together the butter and sugars until it forms a paste-like consistency. Do not worry if the butter will separate from the sugar while it sits. Whisk in the eggs and vanilla until completely incorporated. Then slowly mix in the flour mixture. Once most of the flour has been mix in, fold in the chocolate chunks. Scoop the dough out onto a baking sheet lined with parchment paper. Dough balls can be placed right next to one another. Sprinkle the tops with a coarse or flaky sea salt. Cover the baking sheet with plastic wrap and place in the freezer for at least 10 minutes. When ready to bake, preheat the oven to 375 degrees. Transfer the dough balls to another baking sheet so that they are 2 inches apart. Place in the oven the turn temperature down to 350. Bake for 15 minutes, or until they are golden brown around the edges. If you like soft cookies, bake for only 12 minutes, or until the edges look set but the middle looks slightly undercooked.